I absolutely love discovering new authors and Mark Farrer is certainly a new author for me anyway. 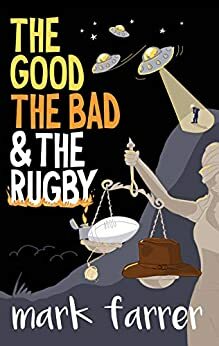 I love to read crime stories that are a little out of the ordinary and that’s certainly the way I would describe ‘The Good, The Bad & The Rugby’. I really enjoyed reading it but more about that in a bit. I absolutely loved the range of characters in this book who are all a little unique in their own way. There are your eccentrics, your weird people, characters you will love and characters you will hate. So a mixed bag but each balance the other out if that makes sense. The main character is a man called Cullen, who is certainly intriguing and he takes the lead in solving the latest crime. I picked this book up at the right time for me as I was in need of a fun, light hearted and hopefully funny book to distract me from the worries of the day. I can honestly say that I haven’t laughed as much, whilst reading a book as I did whilst reading ‘The Good, The Bad & The Rugby’. It was pretty much a chuckle fest as I found myself chuckling away all the way through the book. There are so many funny incidences, witty quips and hilarious characters that I can guarantee that it would be nigh on impossible to read the book and not laugh at some point. The author’s writing style is such that you can’t help but be drawn into the story and then bam before you know it you are addicted to it and you can’t stop reading it. That’s what happened to me anyway. I had to keep reading to see if Cullen solved the crime and if the book could possibly get any funnier. The author uses such vivid descriptions that I was literally picturing the action taking place in my head whilst I was reading the book, which made me chuckle all the more. I had hoped to ration how much of this book I read in one go but that intention soon flew out of the window as I was enjoying the book so much that I couldn’t put it down. The pages turned that quickly that it was almost as if they were turning themselves and before I knew it I had finished the book, which I was so disappointed about. They do say that laughter is the best medicine and this book has certainly proven that to be true. I even forgot why it was that I had needed a distraction!! In short I absolutely loved reading ‘The Good, The Bad & The Rugby’ and I can guarantee that you will love it too. I can’t wait to read what Mark comes up with next but in the meantime I will definitely be finding his other books and reading them as soon as I can. The score on the Ginger Book Geek board is a very well deserved 5* out of 5*.